Related material: later; later still. This Anzac season, as in a number of previous years, Australian children – and possibly some adults, too – can pick up some Anzac mementoes as a side benefit of buying a newspaper. 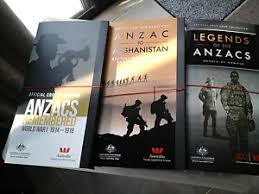 This time, the Murdoch press was the outlet for an official set of ‘Legends of the Anzacs – Medals of Honour’. These were 14 coins (and accompanying text) depicting decorations, campaigns and service medals awarded to Australians over the past 100 years. Profits went to Legacy. As with all such offers, collectors aim to get the full set. Full sets are already available on Gumtree, where profits will presumably not go to Legacy; one is going for $100 (which is a handy mark-up, seeing the set could be got originally by buying newspapers worth around $65-70). The equivalent, smaller sets from 2015 and 2016 do pretty well also; one punter in the Illawarra offers 2015, 2016 and 2017 in a job lot for $230. Below is a full set of a slightly different colour, seven articles for Anzac 2017. Each piece says something that does not fit well with the view of Anzac that encompasses buying and selling commemorative knick-knacks. Honest History Past President, Peter Stanley, gives a lecture at Parliament House. From November 2015, the lecture is about Australia at home during the Great War (see also this book). [The war] affected Australian life in ways we have long known—in the immense grief it inflicted on the relative minority who bore the full brunt of the war’s sacrifice, and in the heightened sense of national identity which is often held to be a compensation. But it also tore apart families, communities and a major political party, it turned a law-abiding community of German-Australians into pariahs, it made a mockery of Australia’s devotion to the rule of law and arguably wounded the independence of its people. It’s right that today, in this place, we should remember it all. Christopher Bantick recalls the trauma that returned soldiers brought home to their families. The article is particularly about the burden borne by women in dealing with the aftermath of war. The growth in the commemoration of Anzac has become a cultural transference. We are a society, impoverished by any historical sophistication, which looks to its military to define itself. This is a male tradition which relegates the voices of women to those of flag-waving spectators or, more telling still, silence. James Brown (Anzac’s Long Shadow) anticipates remembering comrades on Anzac Day but also notes with approval a recent shift from nostalgic commemoration to practical consideration of the needs of recent veterans. It’s great to see so many people come out for Anzac Day services but we’ve got to make sure they’re still there on the 26th of April, thinking about the help that veterans and their families need. And thinking about how the government makes decisions about sending someone to war, it’s really important. Australian sport [says Leach] has been a willing ally in the renaissance of ANZAC Day. Big on symbolism, short on detail and hostile to dissent, contemporary ANZAC culture has become Australia’s chosen day to celebrate a singular notion of identity, virtue and sacrifice … And at the heart of the rebirth of ANZAC Day – in Victoria at least – is a game of football which, whilst draped in remembrance, is a civic spectacle that has become as much about us as it is about those who served. France is beautiful but it rains too much, [wrote Lance Corporal Charles Blackman]. One thing is, clouds here never need to thunder – the guns do all the thundering … and the flashes they make, it’s just like lightning. Over 7000 Jews have fought in Australia’s military conflicts, including more than 330 who gave their lives [says the blurb for the book]. While Sir John Monash is the best known, in Jewish Anzacs acclaimed writer and historian Mark Dapin reveals the personal, often extraordinary, stories of many other Jewish servicemen and women: from air aces to POWs, from nurses to generals, from generation to generation. War was too complex a business, the behaviour of men too ambivalent and contradictory, and the reporting too unreliable to be reduced to anything that could be semaphored with a flag or a cliché. “Truthful history” was the best tribute a nation could pay: history that did “full credit to the courage, endurance and soldierly ability of the American citizen, no matter what section of the country he hailed from, or in what ranks he fought”. Having said all of the above, and returning for the moment to Anzac knick-knacks, plenty of this hairy little item will be marching out of the Australian War Memorial shop tomorrow, Anzac Day. ‘Standing tall and looking smart in his First World War uniform, Digger bear makes a friendly companion. He reminds us of the young men of the Australian Imperial Force who volunteered and served overseas from 1914–1919.’ An absolute snap at $64.99. Proceeds from the Memorial shop go towards the work of the Memorial but, somewhere back down the chain that produced Lance Corporal Digger bear, someone is busily making a dollar or two out of Anzac, sewing Digger’s cute uniform or stitching his beady little eyes onto his lovable scruffy face. It’s the enterprising spirit, one of those ‘Australian values’ that we are told those young men of the AIF fought for all those years ago.